This past Tuesday I had the good fortune to go to the Sherman Park branch library of the Chicago Public Library system in order to do an hour-long program on water and sustainability for neighborhood teens. The librarian who invited me, Faith Rice, encouraged me to be as “hands-on” as possible instead of just lecturing, which suited me just fine — so I brought my surface water testing kit, turbidity tube, bucket, and assorted supplies in the hope that we could leave the library and do some sampling of the lovely, meandering lagoon of historic Sherman Park on Chicago’s South Side. As I made the drive from Roosevelt in the Loop down to Garfield Avenue, it began to rain. Perfect, I thought, for an afternoon dedicated to talking about water — but the downside was that the rain caused some of the teens who walk or ride their bikes to the library to go home early before our 4pm session. Nevertheless, when I arrived I was welcomed by Faith’s colleague, Lala, who got me set up in the lovely old library’s classroom and assured me we could step outside to the park and get a bucket of water for testing. We took another bucketful of water back into the library’s classroom to do a few more quick tests before the kids needed to leave by 5pm. As we re-entered, we caught the attention of the security guard, who betrayed her interest in our somewhat noisy (and wet) experiments — so I invited her and an adult patron to join us. They let the kids do all the work, but we also chatted about their ideas and assumptions about the quality of water in the lagoon as well as the ongoing issue of lead contamination of Chicago’s drinking water. The kids measured the temperature of the water (26 degrees C, a bit high for most aquatic life, but indicative of our near-shore sampling and the hot summer in Chicago); pH (8.9, fairly alkaline but still within an acceptable range); and nitrate (0-0.1ppm, a relatively low level of a nutrient that can cause harmful algal blooms). While we didn’t have time to conduct more comprehensive tests, the kids were able to assess the current water quality of the lagoon as “so-so” — OK in some respects, not so good in others — which pretty much jibes with most of my water quality sampling results on the Chicago River the last several years with my Roosevelt University students. 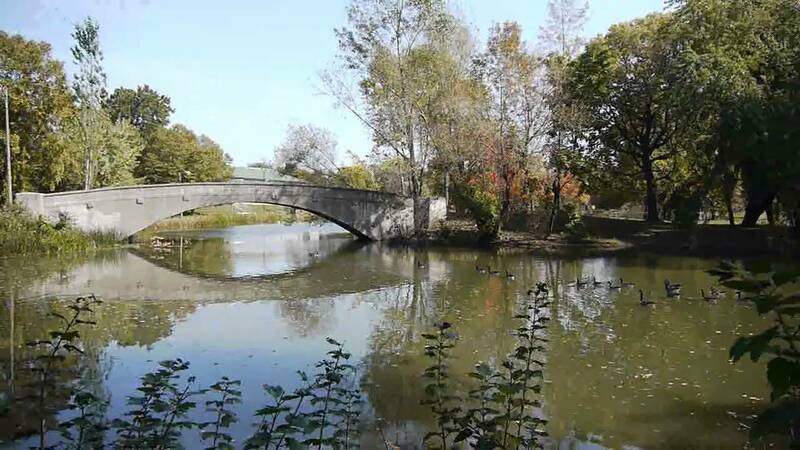 Beyond those quantitative assessments, though, what impressed me about the afternoon’s adventure was the importance of parklands and water bodies here in the vast urban landscape of Chicago. 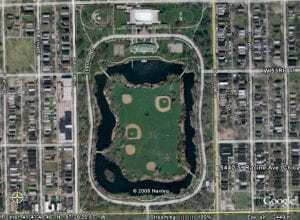 Just as the Sherman Park branch library is an oasis of education, literacy, and community programming (for kids and adults alike), so too are the meadows, woods, and lagoon of Sherman Park itself a vital natural resource for the neighborhood’s residents. Getting one’s feet a little muddy at the banks of the lagoon taking water samples drives that point home in a tangible (and fun) way. 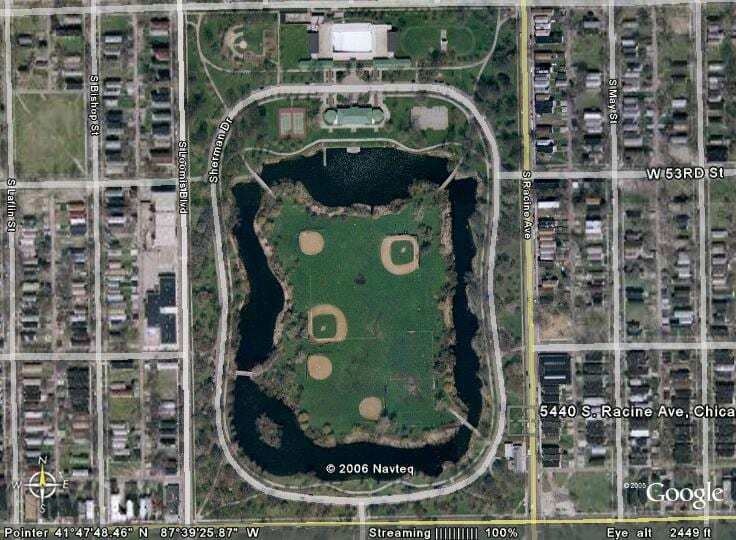 This entry was posted in Chicago, Community, Events, Parklands, Students, Water. Bookmark the permalink.